Between the time I launched my original bloggity blog in August 2010 and now, it’s gone through no less than three major redesigns (I don’t even have screenshots of the original layout because it was just so atrocious) and header updates. I’ve written and re-written and edited and re-edited my “About Me” page, I’ve created landing pages and reworked navigation menus, I’ve moved widgets and installed plugins and worked and zonkified and given myself heart attacks by accidentally inputting wonky code and crashing my own blog. Indeed, this blog is no stranger to change. … updating and refreshing your blog is something I’d consider both healthy and necessary for most bloggers. But then why, one might ask, did I decide to take things a few steps further this time and change my entire blog — title included? The obvious answer is that I had lost quite a bit of my blogging mojo over the past few months… half a year… whatever… and needed a change in scenery to help me get back into the groove. Which, of course, is true, but it bears noting that all my past blog updates have generally yielded the same result. I mean, getting a shiny new header pic, changing a fontset, or installing a new theme is usually enough to stoke the flames of my blogging fire, so why’d I have to go so far as to change my name, my URL, my blogging identity? Well, the truth is that I wasn’t just unmotivated to blog. It’s not that I didn’t want to write, to keep up with you guys, to be able to bear my soul (and/or vainly force you to look at pictures of myself) on a regular basis. It’s that when I did try to blog, I felt disingenuous. After all, I had a weight loss blog and I really wasn’t into losing weight anymore. I tried to keep it up, to kick my weight loss efforts back into action and utilize the accountability that this blog has always provided me, but something just wasn’t right. It felt forced, it made me resentful, and thus, I continued to get worse and worse about updating this blog. Of course, I know that not all of my readers were coming here solely for updates on my weight loss progress, and that many of my awesome internet friends actually (bewilderingly) seemed to enjoy posts simply about the goings-on of my daily life. But even when I did write about that stuff, I felt like I was ignoring the mission of my blog. Which made me feel like a fraud. I felt like, because of the specific focus from which my blog was born, I still had to address my body and my attempts at losing weight. So, instead of being able to truly blog about whatever I wanted to, I still had to somehow fit in a line about my weight loss attempts… which had become nonexistent… which just meant I was coming up with excuses… and that made me feel lousy. So. Where did that leave me? In a very sad place, of course! I was a blogger without a blog, essentially. At least, without one she wanted to contribute to. And so, after a few weeks of soul-searching and a few failed attempts at journal-writing (I mean, hello, what’s the point of baring my soul if people can’t comment on my thoughts?! ), I decided that what I most definitely did not want is to stop blogging all together. But maybe I just needed to broaden my horizons a bit and open up the focus of this blog. I liken it to being given a writing assignment in class. The teacher says, “Write a story.” And you spend an entire week just trying to figure out what you want to write about, let alone doing the actual writing. But when your teacher says, “Write a story about a kid who discovers a time machine,” your brain is immediately alight with ideas. You’ve got a focus, a direction, and you still get to figure out all the details on your own, but you’ve got a good place to start. So when I started Honey, I Shrunk the Gretchen! as a weight-loss blog, it was great. I had a never-ending slew of inspiration for posts because, even if I ran out of ideas or things weren’t particularly exciting in my life that week, I could always bring it back to one thing: my weight loss efforts. I could blog about what I ate the day before, or I could report on my latest weigh-in, and that was that. Until, of course, I didn’t want to blog about those things anymore, as mentioned. So, here we are! I made the executive decision to rebrand my blog, which has had the simultaneous effects of rejuvenating my blogging mojo (because, y’know, it’s all shiny and new again) and also refocusing my blog mission to more accurately reflect my interests. And while I am taking a bit of a risk, since my new focus (body acceptance and love, partially, but mostly just my life) is much broader and less specific than my last one (weight loss and health), so far it seems to be working out pretty well! After all, it might be harder for me to think up interesting topics from time to time, but at least I won’t feel like a bit fat phony when I do. You might notice that things are looking a little different around here! I figured that with my focus shifting so much from the original weight-loss roots of The Blog Formerly Known As Honey, I Shrunk the Gretchen, it’d be nice to have a fresh start, fresh title, and fresh layout to go with. What do you think? Hopefully it’s not too bad for my first attempt at creating all this stuff, header included, myself, eh? I live in the in-between stages of life. For the longest time, I thought I needed to fit into this box or that. I wanted to label myself as the fun, bubbly girl OR the quiet, introspective girl OR the nerdy fangirl OR the creative artist. I didn’t really understand that not only is it possible to be all of those things at the same time, it’s pretty much a requirement. Nobody is just one thing. So, yes, I’m a little bit country, a little bit rock ‘n’ roll okay, okay, I’ll stop of everything at all once, and I wouldn’t have it any other way. Thus, my new(ish) blog needed to embrace that very aspect of myself! So welcome, or welcome back, to this new chapter in life. I’m glad you’re here. Let’s have some fun, shall we? Whaddya know, I still have a blog. Guess I kind of forgot about it in all the post-Yelper Party mayhem, eh? Well, if there is only one person reading this, then I definitely only have myself to blame for that (but thank you to that one person *coughmomcough* for sticking with me!). I just popped in to say that I know I’ve been a bad, bad blogger recently, but I actually have some fun news to share. See, I think that the time away from the pressures of feeling bad about not blogging (or writing) has given me the break that I needed to recharge my batteries. Work craziness has died down somewhat and I’m returning to a state of normalcy, which means I’m actually itching to get back in the saddle, as it were! Of course, with the break from blogging and the mental reset also came a few realizations (that tie in pretty well with the content of my last post). See, I think that those of you who suggested I consider rebranding and refocusing this here blog are right! I’ve spent almost four (!!) amazing years with Honey, I Shrunk the Gretchen! and I’ve grown up and I’ve lost weight and I’ve learned more about myself than I thought I ever would, but, as you have no doubt noticed, my priorities have definitely changed. Weight loss itself hasn’t been a priority for me in quite a while — at least not in the same way that it once was. And I’m actually pretty okay with that. I’m actually pretty okay with myself right now… for like, the first time ever, hahahaha. So I’d like this blog to be a bit more reflective of that. Of my new perspective, of my new goals (or my lack of goals), of the fact that I’m a different gal than I was 4 years ago. So I’ll be rebranding this blog to be representative of exactly that! So I was trying to come up with a clever portmanteau word that combines “blogging” with “hobby”, and I ended up with “blobby.” So even though it’s not clever at all, I’m keeping it because it makes me laugh. Heh. Anyway, I wanted to talk a little bit about blogging as a whole today. It starts with this epic webcomic from The Oatmeal that my friend Lara alerted me to, and it ends with me finally addressing why my posting to this blog has taken such a backseat in my life lately. See, in a much more humorous and perfect way than I could, Oatmeal creator Matt Inman explains why it’s both rewarding and challenging to be a web content creator. Now, really, that title could cover any number of things: bloggger, vlogger, Youtube singer/songwriter, writer for an online publication, etc, etc. The actual job itself doesn’t matter so much as the fact that what you’re doing is on and for the Almighty Interwebs. As Oats puts it, “Your career + the internet = sad.” Now, of course, it goes without saying that this little blog is nothing compared to a site like The Oatmeal, and also that this is not my full-time job. So while I do feel pressures to maintain this site, to make sure it’s regularly updated and accessible (been having particular issues with that lately — my apologies! ), it’s not quite the same as knowing my income or living standard is dependent on my pageviews. That said, the pressures are still there. It sounds silly to even admit, but what can I say? I’m a people pleaser, and I love writing this blog, and I love that you guys continue to come back here to read it. But I think it’s probably fairly obvious to most of you that things over here have been a little lax and a little lacking lately, both in my general healthy living efforts, and in my blogging about said efforts. And I feel guilty about that. I feel guilty when I can’t think of anything to write about, when I just don’t feel like taking the time to whip out my camera because I am so hungry can I please just eat already. So, without trying to sound like I’m so egotistical to think that your life is lacking without a daily update from yours truly (even though I totally am), at least I feel kind of bad about it? Hahaha. I’ve mentioned it before, but the obvious reasoning for that is because almost 100% of my extracurricular (er, extraworkulcar?) time is being devoted to finishing the edits of my book. I am still desperately trying to meet my (self-imposed) deadline of a December release. (Hey, remember when I said that I was looking at a mid-November release? Haaaaaahahahahahaha. That was funny. Cry.) And that’s a whole other layer of pressure and anxiety (again, this is all kind of silly, because I know when push comes to shove, it’s pressure I put on myself, but still) on top of this one. So ultimately, it makes sense that something starts to give. And because, as much as I love this blog, it is still my hobby, whereas I am hoping that someday I can turn fiction writing into my career, it means that this is the thing that has to give a little. It means sometimes, I only update twice a week. And sometimes, my posts are barely more than pictures of my dogs, because they make me happy. And a lot of the time, you’ll find me whining into the great social media void. Heh, sorry about that last one. Shockingly, this wasn’t actually meant to be one giant apology for not posting as regularly lately, even though that’s kind how it’s sounding, haha. It’s just an update on where things stand. And to say that I–the Honey, I Shrunk the Gretchen blogging me–am not going anywhere. It just may take a little bit of time to fully come back around. But hey, job or hobby, that’s how everything is, right? There are bumps and dips, hills and valleys. But I’ve spent 2 1/2 years on this particular blobby of mine (kekeke), and I certainly don’t envision giving up on it for a long, long time. Aaaaand, to cap things off, especially so there’s something here for you wordy-post-skimmers (I don’t blame you! 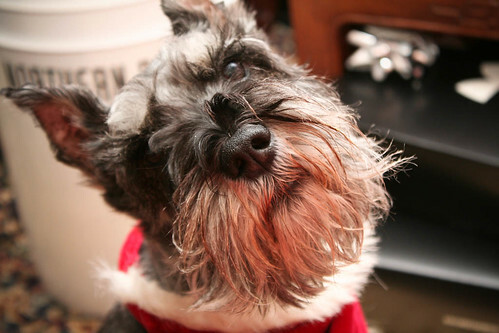 ), here are some picture of festive holiday schnauzers. 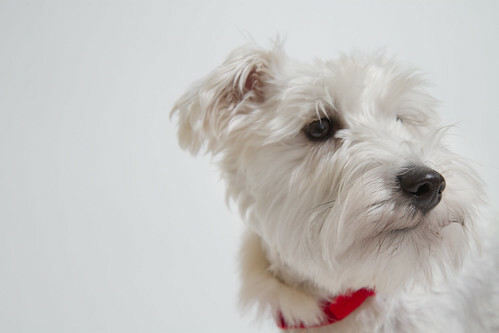 Well, some holiday schnauzers, at any rate. They probably weren’t feeling particularly festive, but oh well.